Next year the LHC will start running again at 13 TeV, almost double the previous energy, and the protons will be collided together every 25 nano seconds, twice as often as in 2012, thus ATLAS needed a new detector layer nearer to the collision point to help reconstruct the debris of each collision. The ATLAS Detector is big (46m long, 25m diameter), and at first it was difficult to believe there would be available extra space for a new detector but in fact reduction of the diameter of the beam pipe itself was proposed. The IBL was just inserted into ATLAS last month. It was an important and unique goal in that game. Next week during the Football World Cup in Brazil, we will see how 11 players will easily insert two or three balls into the goals in a few tens of minutes, but the insertion of the IBL was indeed a more difficult task. The IBL championship began several years ago, when the decision to insert a fourth pixel layer into the newly reduced beam pipe was made, to improve the tracking system and to compensate for the irreparable failures in other layers. The IBL has been installed after a lot of work and technical support from many Captains playing in the ATLAS club, between the existing pixel system and a new smaller radius beam-pipe at a radius of just 3.3 cm. To cope with the high radiation and pixel occupancy due to the proximity to the interaction point, a new read-out chip and a newer version of the planar pixel sensors, and a completely new design called 3D silicon were invited from all over the world to help in this championship. 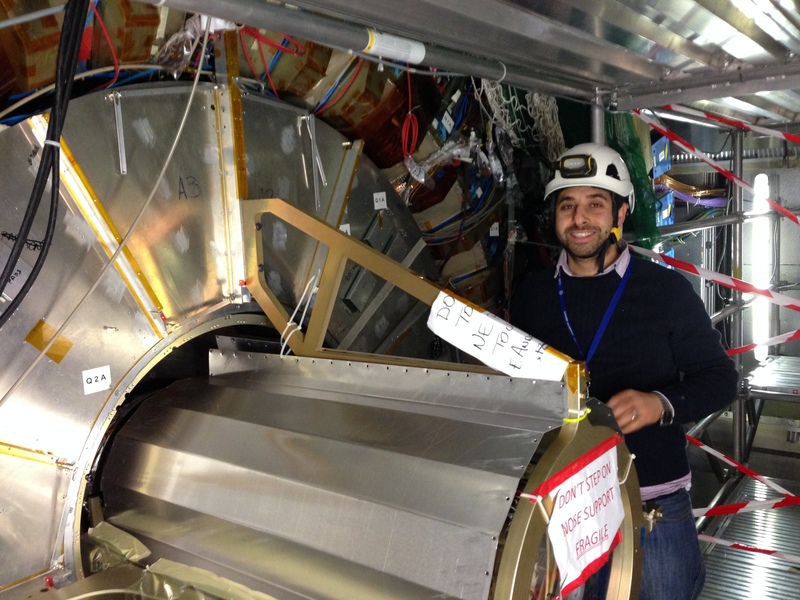 Moreover, a lot of work has been done to improve the physics performance of the detector to make it more efficient. The IBL is made of 14 staves. A stave is simply the structure that holds the pixel modules which are the main players in the detection process. There are types of modules on each stave, 3D modules on the ends that Clara discussed last week in her blog, and planar modules covering the central part of the stave. As detailed health tests for players are needed to make sure only the fittest are accepted as a main team player, detailed tests and selection rules are used to choose the best modules, electronics, services, cables and staves to select the best and the most high quality parts. I worked on this analysis to identify the highest quality modules and staves to be used to build the IBL. The IBL was finally assembled and tested and it was installed last month successfully inside the inner detector. Soon the cosmic testing will begin to perform the detector commissioning and calibration. To finalize this comparison to the World cup in Brazil, the football team performs their training in 30 degree heat wearing their football kit in the muddy fields outside while the IBL team prefers to do their work inside the chilly clean rooms wearing lab coats. Ahmed Bassalat is a Palestinian PhD student at LAL, France, working on IBL and planar pixel sensors for ATLAS and the VBF H->invisible analysis channel. He joined Paris sud 11 University in France after getting his Bachelor degree from An-Najah National University in Nablus, Palestine. Ahmed is working to get Palestinian students and Universities more involved in High Energy Physics.